The Road Runners Club of America, the largest grassroots running organization in the country, has selected September 21 as the date for the second annual RRCA National Run at Work Day. 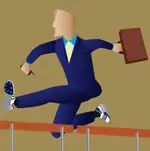 The purpose of National Run at Work Day is to promote physical activity and healthy living through running or walking. The goal of the RRCA National Run@Work Day is to raise awareness about the importance of daily physical activity for adults. The Run@Work day events will be community based events that promote and provide the opportunity for individuals to incorporate at least thirty-five minutes of exercise into their daily routine either before work, during lunch or immediately following work. Incorporating exercise into one's daily routine can markedly improve one's overall physical health and can help alleviate health-related medical costs associated with overweight and obesity. Sign the pledge to run or walk at least 35 minutes on September 21, 2007 in support of the RRCA National Run@Work Day. I have to say that I like the idea in the abstract. Running at work is a great way to spend the lunch hour. I can speak from personal experience during my corporate days that running at lunch was my salvation. Seriously, life in the cube was miserable. Busting out at lunch for five hard miles with my buddies was something I both dreaded and looked forward to. I can still remember those guys--Cyril Oblouk, Andrew and Johnny Estrada, and some of the Allergan boys we'd meet on the road--and remember that stretch of Culver Drive where the pace went from convenient to test-of-manhood. Sweat: You run hard, you shower, you hustle back to your desk. In what... 45 minutes? Even after the shower you're still a soup sandwich, sweating through your pressed cotton shirt like a human sieve. Or worse, wear wool. Nothing says "wet sheep" like a guy just back from a lunchtime run. Competition: I'm not talking about the fellow runners, I'm talking about the fellow employees. There used to be a guy named Borden who walked hard each day at lunch. We worked together. We didn't get along. One day I was out running along a bike path. One side fell hard into a culvert. I was running one direction, Borden was power-walking from the other. If one of us didn't give way, someone was going to drop a long way into some swampy water. He was my boss. I gave way. To this day, I think of how delicious it would have felt to use some of my old cross-country high-elbow tactics instead. Real life: I kept getting promoted, despite my obvious lack of corporate aptitude. Soon I was the major domo for a VP who liked to travel. I was in the office by 5:30 most days, and not home until 7. How did I spend my lunch hours? Plotting my escape. I wrote and wrote and wrote and wrote. I didn't train much, and when I did, it was long doleful runs after the rest of the boys had finished their lunch. When you work that long, there's no real lunch hour, just a gap in the schedule. So the moral in all this? Run at lunch on September 21. You'll be glad you did. It could just change your life--and your job. Martin Dugard is an Active Expert and the New York Times bestselling author of Chasing Lance (Little, Brown, 2005). Contact him at www.martindugard.com.